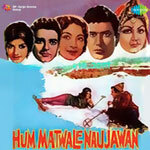 "Hum Matwale Naujawan" is a 1961 hindi film which has Shekhar, Sayeeda Khan, Jeevan, Agha, Chaman Puri and Lalian in lead roles. We have one song lyrics and one video song of Hum Matwale Naujawan. Chitragupt has composed its music. Mukesh has sung these songs while Majrooh Sultanpuri has penned its lyrics.